It's unsurprising that Singer's new novel, originally published in Yiddish (Der Baal-Tshuve) in 1974, was not quickly offered in English translation: this is the Nobel winner's thinnest, most didactic fiction by far, with strident views (not expressed by IBS directly, it's true) that might warm the hearts of Jerry Falwell & Co. as well as those of Jews opposed to assimilation. 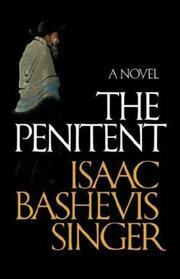 The narrator, telling his story to Singer in 1969 Jerusalem, is rabbis' descendant Joseph Shapiro--a Holocaust survivor (he fled from Poland to Russia) who rediscovers his childhood sweetheart, emigrates with her to postwar America, makes big money in real estate, takes an obligatory mistress. . . and is thoroughly disgusted: "I lay deep in the mire and did the devil's work." On the other hand, he doesn't have enough faith to choose religion over Sodom: "I hated the modern world and everything it represented. . . but I had no proof whatsoever that the Torah had been given by God or that there even was a God." Still, faith or no faith, after discovering the infidelities of both wife and mistress, Shapiro renounces his uptown N.Y. life, becomes a Singeresque vegetarian on the spot, wanders into a Lower East Side shul to rediscover the old Jewishness ("the so-called new Jewishness was actually the same as worldliness"), and hears a voice telling him to flee Satan's New York and go to Israel. ("Flee from women who live like whores and demand to be loved and honored.") True, there are stumbling-blocks along the way: a brief surrender to the "Evil Spirit" in the form of a sluttish woman; disillusionment about over-worldly Israel. ("It's just one step from assimilation to conversion, and sometimes no more than a generation or two from conversion to Nazism.") But soon Shapiro leaves Tel Aviv for Jerusalem--joining a study house, becoming a "Talmud Jew," shunning all specks of secular humanism ("The slightest compromise that you make with the culture of the Gentiles and Jewish pagans is a gesture toward evil"), taking a virtuous new wife. . . and finding faith: "Long before you feel a total faith, you must act in a Jewish way. Jewishness leads to faith." Is Shapiro, then, a stand-in for Singer--Not entirely, presumably--since Singer remains in Manhattan with the pagans. But there's no suggestion of skepticism or disagreement here, making it difficult not to read Shapiro's born-again-Jewish opinions--which include wholesale put-downs of Tolstoy, Homer, psychoanalysis, and other worldliness--as the author's. And, though Singer's storytelling genius isn't totally absent from this slight, linear tale, it's primarily for students of his work-and-thought--while much of his usual readership will find it merely puzzling or off-putting.